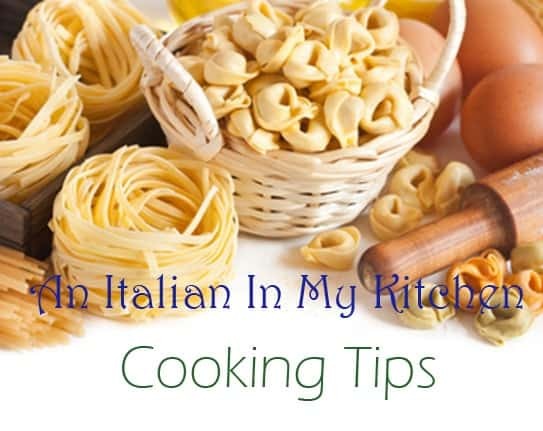 Cooking Tips, looking for help with trying out some of my Italian Recipes? I hope these Cooking Tips will help. Always boil pasta in salted boiling water. Always buy a good pasta and cook till al dente, if it is a good package following the cooking time on the box is a good idea. Conserva is called tomato puree in english, not to be confused with tomato paste. 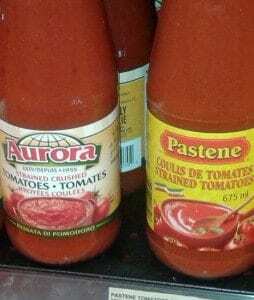 Tomato paste is much thicker and a stronger taste, please don’t substitute one for the other. When I write a lasagna recipe, it isn’t necessary to use fresh egg pasta, in fact I find (and my family seems to enjoy more) the new oven ready lasagne (no boiling needed) is a perfect alternative. I’m sure you can find it in the pasta section of your supermarket. Fresh ingredients are always the best, fresh is what I use in all my recipes, unless otherwise written. Salt and tasting is really important in Italian cooking, you can always add salt but it you can’t take it away, (sometimes you might be able to correct or try by adding more water) so remember to taste, taste in the beginning, taste in the middle of cooking and taste just before the end of cooking. If a cake recipe calls for more than one egg and the cake is dry instead of 2 or 3 eggs substitute 1 or 2 eggs and 1 egg yolk. Turn the oven down by 10 degrees. If your cookie dough is too dry (crumbly) add some softened butter to the dough to soften it up and then proceed with recipe. Making the Best Italian Pastry Cream. Before turning on the heat mix your dry ingredients. Heat the (liquids) milk and cream (if using cream) until hot but do not boil, (unless you are making my other Pastry Cream without cream). Make sure you have 15-20 minutes of non interrupted stirring time, don’t stop stirring! Immediately place thickened cream in a clean bowl, cover with plastic wrap, make sure it touches the Pastry Cream. Let Pastry Cream cool to room temperature and then refrigerate. I have a trick on making the best rice, cook it like pasta. Meaning boil a big pot of water, add some salt and then toss in the rice. Make sure to cook it al dente, drain well and serve. Works every time.